Mill: A company that takes raw materials and manufactures fabrics and textile products by spinning, weaving, knitting, etc. 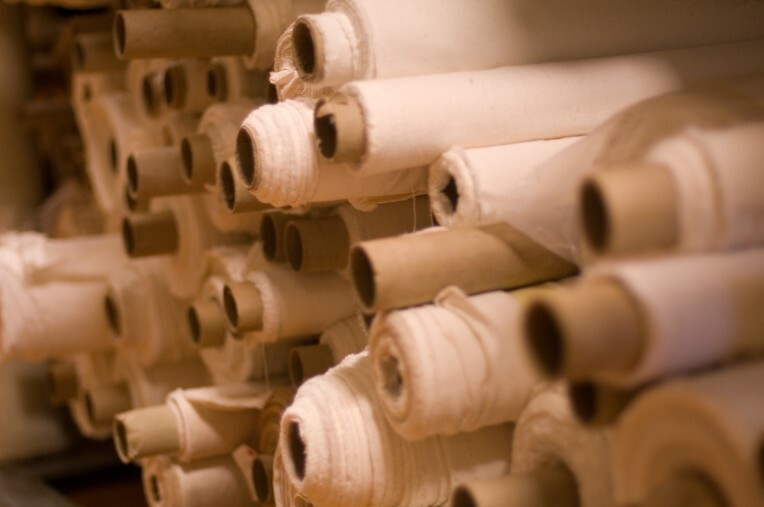 Many mills offer made to order fabrics, and typically have high minimums of 1,000-5,000 yards. Converter: A person or company that purchases unprocessed or greige goods directly from a fabric mill, and then proceeds to dye, finish, print and/or wash the goods into finished fabrics. Converters tend to offer current fashion colors, prints, novelty finishes and specialty effects on fabrics. Their minimums are lower than dealing directly with a mill; occasionally a converter will take a 500-yard or less order for custom finishing, and you may be able to buy as little as 1 roll of stock materials. Jobber: A person or company that purchases over runs (excess finished fabrics from mills and converters), odd lots (leftover goods from larger manufacturers), and seconds (often flawed or otherwise inferior in quality). They turn around and sell fabric wholesale at very low minimum quantities to small design companies, manufacturers, and retail fabric stores. 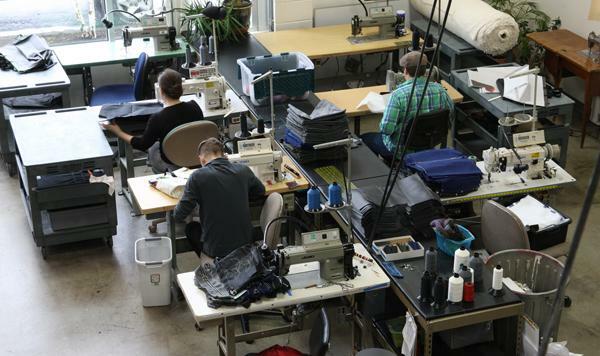 Many of their fabrics are not reorderable and lack continuity, so jobbers may not be an ideal source for larger production orders and the longer lead times of traditional design and sales cycles. Rep: A sales representative is an agent that shows fabrics from one or more companies and works directly with manufacturers and other textile customers, often in a specific territory. This tends to be the easiest way to work with overseas mills, and can potentially streamline the process of sourcing from several companies in a particular niche. 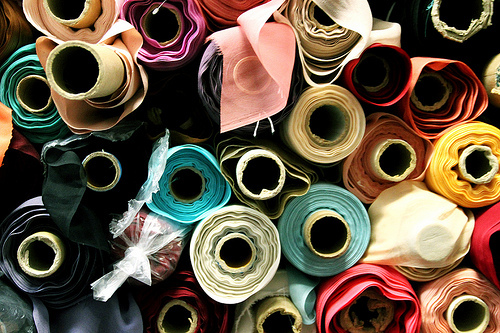 Wholesalers: A general term for all other secondary fabric sources, this includes any other person or company that purchases excess finished fabrics from mills, converters, jobbers, and large manufacturers and sells direct to small manufacturers and small retail fabric stores. D/R stands for “Double and Rolled” – in other words, “Fabric on a Bolt”. Fabric will have a crease down the center. 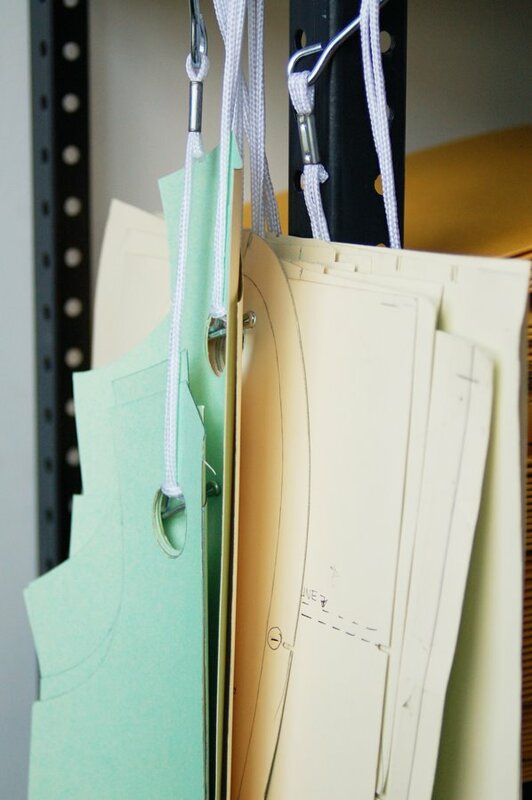 Note: this option may work if you’re doing small quantities yourself, but many cut and sew contractors do not want to work off of a bolt; also the crease may not come out of some fabrics. ROT stands for “Rolled On a Tube.” Fabric is rolled in a single layer. Rolls are preferred for larger volumes, particularly when a spreader is used for production stack cutting. Put Up specifies how many yards of a particular material come on a bolt or roll. Griege goods – undyed yarns are woven or knitted into fabric which may be dyed or printed later. These materials tend to be more affordable and you can typically meet higher minimums at a better price, though you will need to find sources for finishing smaller cuts. Some griege goods are noted as PFD (prepared for dyeing) or PFP (prepared for printing). F.A.S. stands for Free Along Side. It is the cost of the finished goods, plus it includes the delivery of the goods to port, dock, etc. The price does not include loading onto the ship, etc., or the shipping or any other charges incurred from that point on. F.O.B. stands for Free On Board or Freight On Board. It is the cost of the finished goods, plus it includes the delivery of the goods to port and the loading onto the ship, plane, etc. The price does not include the shipping, or any other costs incurred from that point on. “FOB shipping point” or “FOB origin” indicates the buyer pays shipping cost, and takes responsibility for the goods when the goods leave the seller’s premises. In practice this means that once the shipment has been transferred to the carrier, lost shipments are the responsibility of the buyer and carrier. C.I.F. stands for Cost, Insurance and Freight. It is the cost of the finished goods, plus it includes the delivery of the goods to port, the loading onto the ship, etc., the shipping charges, and all applicable insurance fees along the way. The price does not include going through customs, or any duties or other costs incurred from that point on. L.D.P. stands for Landed and Duty Paid. It is the cost of the finished goods, plus it includes the delivery of the goods to port, the loading on to the ship, etc., the shipping charges, and the goods brought through customs, with all applicable duties and taxes paid. Country of origin refers to where the material was made or manufactured whereas ships from refers to the distribution facility where the material is physically packaged and sent. It is not uncommon for a material that is made in one country to ship from another. Always be sure to get final shipping details when importing materials, including the exact cost of shipping, whether it includes customs and duties, carrier, and tracking details. If the cost of shipping does not include customs or duties, you may receive an invoice from the carrier upon delivery asking to remit payment. If your order is being sent via an air carrier rather than a traditional courier service (i.e. FedEx, UPS, DHL), you may have to arrange for customs clearance at the port of arrival. Allow extra time for orders to clear Customs, as delays are likely due to increased security measures, international holidays, and general backlog. 3-10 days or more buffer should be factored in on international shipments. Who Should Make Your Patterns?